Exploring new paradigms in digital music creation. Sound artist specialised in algorithmic composition. In 1996 he creates the electronic experimentatal band EVOL . From 1997 he directs together with Anna Ramos the record company ALKU . His work explores the possibilities of algorithmic composition in the electronic music production and it is often based onthe deconstruction of iconic sounds from rave culture. His work has been shown in galleries, museums and clubs of Europe, North America and Asia and it has been edited by international record companies like Entr’acte, Mego, Presto! ?, fals.ch. His residence at Hangar is taking place in the framework of ‘Addicted2random’, a European project on generative music. 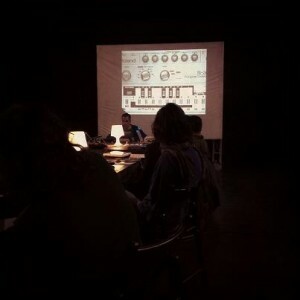 The aim of the project is to investigate on the connections between European musical past and contemporary music generated by computer. The piece that he’ll develope during the residence is an aesthetic and formal extension of acid house. This is going to be a new layer in his intention of decontextualising rave iconic sounds as he also does together with Stephen Sharp in the project EVOL . During his residency he will also give the workshop ‘Post-acid autònom’, an introduction to sound synthesis and generative composition. This entry was posted in Project by marta. Bookmark the permalink.